Very quiet resort great day time when sunbathing but come evening time too quiet and i usually like quiet as not fan of noisy resorts.no entertainment really just one bar to sit in all evening with handfull of people in most nights.some drinks not free as i found out when went all inclusive and asked for a baileys.only spanish drinks free. 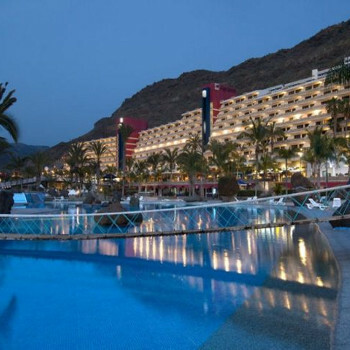 If you want hustle and bustle, stay at Gran Canaria's Puerto Rico with its McDonalds and all the bars on the main strip. However Playa Taurito just around the bay is small and quiet with a central public park, pool, exercise track and well kept gardens. Cars are discretely tucked away in an underground carpark. Cars from the hotels and apartments are also discretely parked in the side roads so the appearance of this resort is neat and tidy. On either side of the park which runs down to the beach are the handful of large hotels with the two prime spots at either end of the short beach occupied by the two hotels in the Princess Group. The few other hotels are still within short walking distance of the beach. There are clothes and souvenir shops adjacent to the central park including a pharmacy, clinic, carhire and supermarket. The black sand beach is small but adequate and well kept. The tide never seems to come in or go out. There are a couple of cafes and bars right on the beach as well as water sports hire operations. One of the hotels has a bar on one of the strips with an open air seating area. But this is a quiet resort and the disco inside this bar was not noisy. As at November 2008 there are a few new uncompleted hotel and apartment developments up on the cliffs overlooking the park. A very short and cheap public bus ride will take you to the small nearby fishing town of Mogan which although is busy, is also quiet and has numerous good value restaurants some of which are on the quayside. Friday is market day aimed mainly at tourists. The back streets are picturesque and there are a few non-navigable waterways running down to the harbour. Small resort. A few shops and no bars except for on the beach. Building work has nearly finished opposite our hotel. The resort was very small, only a cluster of hotels in a small bay. Hotel entertainment very good, not aware of any entertainment outside of hotel. The beach was clean, not overcrowded & well catered for, in terms of a few little shops & water sports clubs. The locl resort was very clean. There is very little entertainement of the hotel but you can easily get a taxi to the more lively areas. There is a small beach in the bay which was clean with all the usuall water sports ie Jet ski, and banana boats. this is only a small resort with a new hotel being built so there is a lot of dust about but very little litter. the beach is only small but it is cleaned every morning, there is a diving centre and jet ski hire plus paddle boat hire. The resort was a little on the quite side with very little to do if you have children or teenagers to entertain. really clean resort, pretty etc, entertainment , not a lot, for adults we dont drink a lot, but also like a bit of activity without the hussly and bussel, i am a bit fussy i have to say,beach black sand and a med size, ok though, wouldnt go back as 1 we dont normally go back to the same location twice and its a bit restrictive as what to do.